Over the years, paper dolls have provided much more than countless hours of pleasure for children and adults alike. For centuries children have been making paper dolls by hand; commercial or mass production began in Europe in the early 1800s. Although intended as play things, every aspect of the paper doll provides insight into history, culture and life of the day; from costuming to historical events and political and economical trends. These little playthings are truly a representative slice of history. What appear to be three sisters from the 1910s with their two cats and a dog. Well executed design on the paper dolls and costumes. The 13 costumes with 8 hats for the older sisters are interchangeable while the younger sister has two costumes. The costumes in are drawn with fine details. The hats and dresses reflect the fashions of the day. The taller dolls are 7 3/4".. Five (5) crayon drawn and decorated paper dolls created from 'make-do' materials-- the back of pressed board advertising signed. The first is 21 1/2" older girl in a blue dress with large white colors. Her face is drawn as profile with an exaggerated nose and chin. Her hair is curled in tendrils. Created in two pieces. Her feet and legs are applied and watercolor decorated. The second is a 19 3/4" younger fuller girl done in crayon. This doll is actually dressed with a silk bow in her hair, an islet lace neck choker and a handmade chiffon dress, banded at top with the same ribbon as used on her hair. Here gray and orange boots are crayon. The remaining three each measures about 18 1/2". A boy and girl in sailor influenced attire. The third is a Buster Brown look-alike, wearing the familiar red suit with black neck bow and big round eyes. This dolls appear to be created by the same individual. A 7 3/4" tall watercolor paper doll. A tidy gent with broad-set eyes. His 11 costumes appear to be both contemporary to the 1940s while others are vintage. Four are labeled on reverse - lounge suit, yacht suit, full dress suit and tennis suit. Three fine hats accompany the outfits. . A 6 3/4" young woman paper doll with day dresses,party dresses and a night gown, The five (5) outfits with hats are a mixture of day and evening wear. One of the outfits is a coat with a ruffled base. Two dresses with intact tears that have been reinforced with archival tape. Three tabs lacking; otherwise fine. Reverse is blank..
A collection of 16 different trade catalogues for books and games published by Samuel Lowe Company(9 from the 1940s, 5 from the 1950s and 2 from the 1960s). Includes painting and coloring books, games, toy books, general books, toy books and games, fall and Christmas books, Bonnie books, Sturdi-Bilt books, Doll books, Linen-Like books, Lolly Pop Easter stories, doll books, wheel toy books and more. The last catalogue May of 1962 is a folio with product line sheets including such items as sticker fun pack, clean slates, animated cartoon profiles, cloth books, paper doll books and much more. The cover includes a lenticular eye where for the "O" in the word Lowe. With the exception of the last folio with approximately 40 sheets most are approximately 14 pp . Each measures 11" x 8 1/2". . An unused large format book titled Be a Li'l Miss Designer - With this revolutionary new Colorful Self-Sticking Plastic Dressmaking Kit - No Glue No Sewing No Mess! Manufactured by Neptune Plastics, Inc. Brooklyn 16, NY.No. 898. Includes 4 different colors, 6 different styles (patterns), one 13" Model Doll that stands by itself, 4 storage bags for parts and many additional suggestions. "Unlimited Hours of Fun for Girls of Every Age" When opened the inside cover depict images of the various models and instructions. Affixed with plastic spirals at center is a plastic wrapped card that includes the doll, the patterns and the material including ruffled trim pieces. The back cover further promotes the product Instructions on reverse read "Choose your outfit -- cut out paper pattern - cut plastic to shape of pattern -- cut ruffles to size. Dress model with self-sticking clothes and ruffles. Dolls include Miss Holland, Miss Hawaii, Miss Western and Miss America. Measures 13 1/4" x 10 1/2". An 8 1/2" x 6 1/2" litho on pressed board box titled "Little Friends" with acute accents instead of dots on the "i"s. Cover illustration depicts children at play, with one child particularly protective of her doll as others look on. Includes three (3) of four (4) unused 6" paper dolls with costumes and accessories. All are die-cut with original connective ladders in place. The Dolls are A, C, and D. Each costume and accessory is coded on the tab to indicate which accessories go with with costume. . A two-sided 4 " paper doll named Hattie. Four (4) two-sided costumes the reverse is blank Also includes the original An 5 1/4" x 2 3/4" folder with directions within. Hats are lacking. 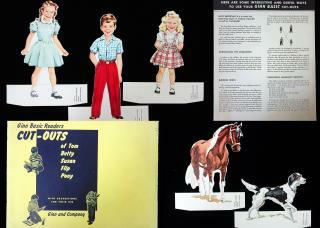 The reverse promotes McLoughlin Bros. Paper Dolls--Book Form priced from $3.75 - $18.00 per gross. priced at 50cents each. Part of Series No. 2. Additionally, a little cutout of a girl holding doll found with the other items. .
A 3 1/2" effeminate paper doll named Little Fred. Includes five 2-sided costumes; reverse is blank. Also includes the original 5 3/8" x 2 1/2" folder with directions within. The reverse promotes McLoughlin Bros Amusing and Instructive Games for Children, priced at 38 or 50 cents. Neck repair. Part of series No. I.. 7 + pp paper doll book - 1 and a 1/4 card stock pages and the back cover are the punch out dolls. The remaining 2 pages are a page of cut-out costumes for each doll. The paper dolls are created after six (6) real models from the John Robert Powers Modeling agency with illustration of Powers looking up at the model lineup on front cover. Images from photographs of Doris Meyer, Angela Green,Lillian O'Donnell, Frances Donelon, Helen Dillard and Eileen Nolans. Each page has a theme including models for the Movies, the Newspaper, as a Dancer, the Radio Star Model, a career girl Model and a Stewardess Model. Each with appropriate background illustrations. Measures 14 3/4" x 9 3/4". .
Unnumbered pages. Illustrated paper covers. The first section of the book provides coloring instructions on the left page and pages to color on the right. Some pages are text explaining h which colors are to be uses; other are colored images mirroring the black and white images on the opposite page. This section depicts whimsical fairy and anthropomorphic animal paper dolls costumes and accessories. The second section is counting down animals from 10 to 1. The final section is an ABC of animals at the zoo. Each with relevant caption. Some pages in full color others in black and white to color. Measures 7 3/4" x 10 1/2". 0 OCLC No online copies. 4/25/16.Like new condition. A 12 1/2" x 10 1/2" book with six (6) paper dolls to cut out from the the covers. Each is dressed in Hispanic influenced attire. Includes four (4) pages of festive traditional costumes to cut for the dolls. Each garment is labeled with the country of origin. The countries include Uruguay, Guatemala, Cuba, Costa Rica, Honduras, Argentina, Dutch Guiana, Paraguay, Ecuador, Columbia, panama, Mexico, Peru, Chili and Bolivia, . A series of life-like miniatures of famous motion picture stars in original costumes worn in pictures.This is the First Series, including eight (8) different paper doll stars, each with three (3) actual movie costumes with accessories. They include Colleen Moore, Rudolph Valentino, Tom Mix, Mae West, Norma Talmadge, Douglas Mac Lean, Norma Shearer and Reginald Denny. Elaborate costumes as seen in the early movies. The reverse is blank. Each measures 10 1/4" x 14 1/4". Scarce. . 15 5/8" x 10 3/4" uncut paper doll book with four (4) 12" adolescent girls - Judy, Betty, Molly and Patsy. Six (6) pages of costumes including play clothes, prom wear, school outfits, shoes with anklets, school books with a book strap and of course hats to match each of the outfits -- everything a Junior Miss would wish for. . Printed in the Netherlands. Large format soft cover paper doll and story book with 12 pp story printed in black and white with relevant line drawings. 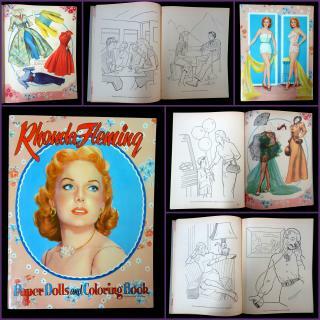 Also includes 4 full color pages of paper doll clothes for a boy and a girl to cut out. A single somewhat gender neutral 10 ï¿½"ï¿½ paper doll on back cover to be cut-out. Measures 12 ï¿½" x 10 ï¿½" This little booklet from Kellogg features the pages cut in three pieces to allow for the flipping of only certain sections which results in the revealing and changing of the scene. 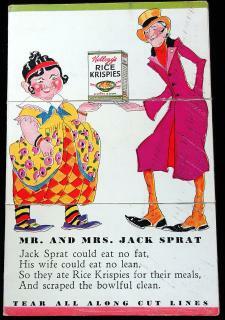 There are several little verses that are rewritten or based on familiar stories, which have been changed to include the purchasing or consuming of Kellogg's Rice Krispies cereal. There are a few illustration that feature the cereal box along with one of the stories. Measures 5 1/2" x 3 1/2". . Naive Pennsylvania Paper Cuts - 2 Woman, a Horse and Cart with Rolling Wheels.
. Minor toning due to age. c1900. Includes two approximately 5" mirror image cutwork (folded in half and cut so left and right sides are identical), a free hand horse with vertical slices in the tail to give the appearance of hair and a folded paper cart constructed of a base, harness and wheels all held in place with straw. Naive pencil decoration on the two woman. Each captioned with age appropriate information re the Borax soap. .
Large format soft cover book with a single page of patterns for Mary, Kitty, Billy and Sally with six (6) pages of paper âœfabric swatchesâ� and one page of trims (buttons and bows). The four paper dolls are on the covers. The largest is 9 1/2"ï¿½ï¿½ high. The book measures 12 1/2" x 10 1/2. The front cover depicts a little girl playing on a porch in front of a door with a die-cut window, exposing her mother on the next page. The last two pages have an additional mother and daughter--could be two sets of twins. There names are Dawn, Celia, Amy and Bonnie. Punch-out dolls and costumes to cut. Measures 12 1/2" x 8 1/2". 6 Costume pages..
A young teenager in her frilly bedroom with a punch-out paper doll and dog. Sweet 1940s outfits including hair ribbons, cardigan's with pearls, knee-highs and jackets with padded shoulder. Die-cut front cover. Measures 11" x 6 3/8" 4 costume pages.. Smart costumes for the statuesque actress for various roles she played.12 5/8" x 10 3/4". Number of Dolls:2. Doll Size: 11 1/2"<. No of Costume Pages: 4. Skating Stars in three different poses. All of their costumes are designed for the ice, including a hula skirts, a sailor suit, princess, rag-a-muffin and much more. Measures 12" xc 10". 6 Costume pages.. A group of 12 early Victorian embossed die-cut scraps depicting English royalty through the ages. Each measure approx. 2 ½ x 6””, depicting a full body image of the ruler. Three include a second small scrap that includes name, information on life span, reign and significant events during the reign. Condition: excellent. Some light edge wear at base. A 13 1/4" embossed die-cut Victorian scrap depicting a young boy in sailor suit and red cap with fishing net. Holds a small tin in his hand. Not marked but most likely Raphael Tuck & Sons. Condition: very light neck bend and light edge wear along left leg. Overall fine. A 7 3/4" male and slightly shorter female two-sided paper dolls. They are drawn in the style of the Brave Boy and the Little Girl He in dashing finery with a sword and feathered hat, she in her outing attire with her dog at her side. Both with creative license, but well executed in the style of. .
Toddler boy and girl approx. 18 1/2" tall heavy card stock paper doll, each with two (2) costumes and two (2) hats. Believe they are Dearie Dolls, published by M.T. Shehan in 1915 or perhaps Tippy Toes or Curly Locks produced by Charles E. Graham -- all were the same dolls, produced by one of two publishers. They are similar to "Woolworth" paper dolls in size and style. Condition: neck and knee bends; generalized light/moderate wear. Soiling on reverse. Three (3) different die-cut advertising head and shoulders paper dolls compliments of S.H. & M. Skirt binding tape. Each depicts an elegant lady of means, dressed for various social events. Perhaps designed as an aspiration the for average child. The reverse of the dress promotes the various bindings available for sale. Printed on the reverse of the front of the dress is information on obtaining the three figures shown by sending five 2 cent stamps to the S.H. & M. Co. NYC. Each measures 8 1/2"..
A rather unusual hand made paper doll. The 3" paper doll is a cutout from a magazine and depicts a rear profile of an older woman. Her two hand made costumes, each have applied shawls and aprons. Costumes constructed of polished and coated paper. Appear to be from the 1860s. Condition: horizontal crease on paper doll waist level. Nice addition to any collection of early paper dolls or as a doll in a miniature doll house. Four (4) different 6" embossed die-cut Victorian scraps of infants or young toddlers. Each with a different flowing gown. Three of the four hold objects. One is in a high chair with the tails of the gown tucked under the legs of the chair. What makes these items particularly unusual is the maturity of their faces and the deep set eyes. REverse is blank. 4 Handmade Watercolor Paper Dolls with a Dolly and Profusion of Costumes, created by Mary Hale Cutler, 1894.. ..
Four (4) approximately 4" paper dolls neatly and compulsively created by Mary Hale Cutler who writes in the handwritten note on the envelope in which they were found "The dresses for all the family. Hat, Dresses, Coats". Dated 1894. Note the wax on the chest of the one doll--this was used to affix the costumes without having to use tabs. Last but not least, not the 1" dolly presumably shared by the girls.. Four (4) approximately 4" paper dolls neatly and compulsively created by Mary Hale Cutler who writes in the handwritten note on the envelope in which they were found "The dresses for all the family. Hat, Dresses, Coats". Dated 1894. Note the wax on the chest of the one doll--this was used to affix the costumes without having to use tabs. Last but not least, not the 1" dolly presumably shared by the girls..
Five (5) different 6 1/2" x 3 1/4" embossed die-cut Victorian scraps. All are snow angels in white fur trimmed coats and hats, with white leggings or boots, standing in the snow. Each with a different object or group of objects. Two with toys and presents, one with a French horn, one with a basket of holly and the final holding a book of carols with a single lit candle. Condition: overall excellent. The last described angel, is missing a small portion of the base; otherwise fine. A 5" watercolor paper doll with hand cutaway to properly position it on costumes. The costumes are constructed with plain, polished and 'make-do' paper. Intricate detailing with applied lace paper, pleated paper, handcut 'fringe' and last but not least applied fur. A 7” handmade paper doll constructed of an embossed die-cut Victorian scrap bodice of a young girl holding a pond boat. Note the anchor on her sleeve. A heavy card stock body form and legs with red and black watercolor stockings and boots. She is dressed in a tissue paper skirt with lace paper trim. All pulled together with a large red tissue paper sash with with fringe tassel. Applied easel back to allow doll to stand. Condition: excellent. Lovely well executed young women paper doll dressed in a slip, black stockings and a hair bow. Costumes with a wide array of design elements and style. Includes one tissue paper dress – the remainder are watercolor. Includes all of the fashion of the day including a middy dress with bloomers, sailor dress, pleated and flounced dress with bead decoration, dress with geometric design and pleats, one with a pinafore, lace color and ruffled base and many others. .
A 9" embossed die-cut jointed or articulated paper doll. The pretty face child has ebony skin-tone and is adorned with a shell necklace and black shoes white anklets. (Littauer & Boysen, Berlin Germany - founded 1887, Sold in 1920.) Comprised of five embossed die-cut pieces and body form. Pieces held in place with brass brads. Excellent condition. A 9” newspaper paper doll with nine (9) two piece handmade paper costumes. Many are interchangeable. Late Victorian period transitioning to Edwardian fashion. Each costume has it’s own charm, many with applied layers of paper ruffles polished paper trim, applied or cut wallpaper and more. Condition: the doll has some wear and is lacking a hand. Housed in an 8 1/2" x 6 3/4" plain blue booklet that when opened reveals a collection of 25 cut-out paper characters from fashion plates. Each of the characters has been affixed to a page and captioned with the name of an individual and their age. The child who created the book then created hand made costumes for each of the characters. They are meticulously constructed with applied or hand drawn details. - one doll or character Mathilde Louise Baumgarten, 13 years old has 6 costumes. Many are constructed from printed papers while others are watercolor or pen and ink. A charming selection of dolls and costumes.. This rather large late Victorian family includes a mother and father and 11 girls and 6 boys. Note that each of the boys is wearing a hat of some form. The older girls are also wearing hat and the younger boys are in short pants.. The dolls range in size from 5 3/4” high to 1 1/2” high. The dolls have simple yet expressive faces. Various emotions portrayed -- just like a real family A charming group of folk art paper dolls. Few small imperfections with minimal detraction. A 6 ½” pencil drawn adolescent girl paper doll with 19 handmade costumes and 15 pinafores. Note the cut bow closure at back and a 3 ½” infant with 11 layettes, 4 dresses and 2 mantles. Many constructed of decorated paper. They were given with a hand constructed pop-up valentine note for Myra H. Gould of Vermont, presumably the receiver of the paper dolls. The dolls were most likely made by the giver at an earlier time in her life. Dolls appear to be c1860s-70s and note from the 1880s.. 28 pp. booklet. Illustrated wraps. The cover depicts an astronomer gazing at the heavens. Designed with advertisments printed on the left and the introduction and horoscopes by sign printed on the right hand page. The horoscope pages are in color and present an overview for those born under the sign. The advertisements are for premiums available from the magazine with the purchase of a subscription. Measures 5 1/2" x 3 1/2". The sketchbook combines advertisement and a year end exhibition to show the work of the students from a free evening drawing school. 10 pages with paper wrappers. The inside front and back covers have the names that correspond with the works of art that were being presented, as well as the graduating class. Each page has several, highly decorative and elaborate advertisement works from various local businesses in or around North Adams, Massachusetts. 7 3/4" x 4 3/4" . 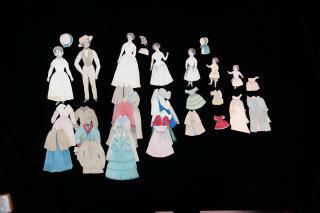 A front and back paper doll created by Forbes Co. consisting of multiple parts to be joined to create the object. The 81/2" x 5" card Compliments of The New Home Sewing Machine Co has a main figure of a sewing machine that folds at top for insertion of head and shoulder component of one of two women - a young lady or an older woman--your preference. It is accompanied by a 9 1/2" x 3 1/2" card is to be cut and constructed to create a back drop for the sewing woman. It is an image of a house and is captioned "Our New Home". Reverse of both cards blank..
6 page paper doll book with heavy stock covers. Paper dolls printed on back cover. Each character has a page of costumes and accessories. They include Bosco the Bear, Monk (monkey), Elmer the Elephant, George the Giraffe and Laffie "the Clown. The final costume page is the circus ring and animal cars. Measures 10 1/2" x 10 3/4".. A 3” x 4 1/2” advertising trade card for Au Bon Marche department store in Paris. A first glance it has the appearance of a die-cut card of a child in a high chair. By pushing the base upwards and side flaps inward it creates a 3D chair with a child in a high chair with a standing wheeled lamb toy at front Light wear. Few areas of missing surface litho. The reverse promotes the department store. One of a number of exceptional novelty cards created by the store. VALCK (Gerard) a Dutch engraver, who died about 1684. He came to England with Booteling, and was some time employed by Logan. A 4 ½” x 4 ½” sheet with profile view of lovely lady accompanied by six (6) different watercolor costumes that overlay the woman creating a different personae with each overlay. Some as men, others as woman of different age and class, or travelers from different lands. Found in a handcrafted box with a marbled paper silhouette of the woman on the cover.. The paper dolls were offered as premiums for a product label and five 2 cent stamps. . A 20 3/4" tall die-cut easel back paper doll depicting Dorothy (Dolly) Quincy holding a bottle of Dr. Miles Restorative Nervine. The reverse introduces Dolly, the future wife of John Hancock and of course promoting the various Dr. Miles with brief narratives and a complete product listing including pricing. Also includes three costumes and hats. The costumes are identified e.g. the gown she wore when first she met John Hancock. Each costume has product information on the reverse. Includes original mailer from Dr. 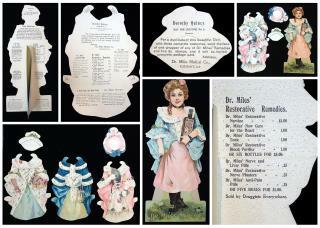 Miles Medical Co.
Two (2) different 13" x 10" uncut paper doll sheets promoting hats for girls. Each page includes an 8 1/2" paper doll, one dress and nien (9) different hats. Each hat has an item number. If the girl was interested in hat she was to ask her mother to purchase it for her at Edson Keith & Co. Reverse is blank. Quite scarce.. A single paper doll set with the same character and costumes as included in "Famous Queens and Martha Washington" a larger boxed set. Illustrated by Elizabeth S. Tucker. It includes Queen Victoria and three period costumes. The doll is wearing a white petticoat covered with a white peignoir tied with a blue bow. the costumes include a walking gown, court robe, and reception robe. Additionally the set includes a booklet with a brief introduction to the doll and instructions on use and play. and the original box top with an applied litho of the queen. Doll 7" tall and booklet and box lid approx. 10" x 8”. An intricately detailed little group of embossed die-cut card stock toys. Includes a lion, lioness and two cuts, who appear somewhat docile with a nearby dish of milk. It also includes a less then docile hyeana who has presumably grabbed meat from the wagon. c1900. Light wear. The lion measures 4 1/2” x 3”. Measures 12 1/2" x 10 3/4" with four (4) 7 1/2" paper dolls on the back cover - Cinderella, Prince Charming and the not so ugly step-sisters. Note the Cinderella on the front cover looks like a statuesque movie star. Six (6) costume pages with costumes for Cinderella before and after, her step-sisters and the prince and of course an array of slippers with "question marks". .
Color newspaper paper dolls series of a good little girl who is always very careful about her dress. Printed on newspring. Each segment includes at least one paper dolls with costumes and accessories and a narrative promoting good behavior, caring and living in a perfect world. A segment captioned New Fall Clothes - Fall 1911 is a narrative on how being proper requires wearing nice new clothes and organizing a sewing society and instead of making things for ourselves we will give them to poor little girls and boys who never have nice things. Anna Belle was unexpectedly elected president and know they will make children happy with the clothes they make. All an interesting approach to socialization. Titles include Anna Belle goes to the seashore, Anna Belle's Grandpa, Anna Belle Visits Sister Mary, Anna Belle's school furniture, new fall clothing, playing moving pictures (Native American costumes), Anna Belle's brother Harold and Baby Sister (note his rifle and sword), Brother Harold's Birthday, School Gymnasium, Getting Ready for School, Anna Belle's Dining Room Furniture, Anna Belle Visits Arabia and Anna Belle's Valentine Party. Several mention the Sewing Circle. Each measures approximately 10" x 7 3/4", cut from a newspaper. . Anna Belle newspaper paper dolls first appeared May 1908 in the Seymour Daily Republican Newspaper, Seymour Ind. 32pp. Dust jacket. Both written & Illustrated by Faith Jaques, the book tells the story of a doll named Tilly, who leaves the her doll house in search of a place of her own. Along the way she befriends a teddy bear named Edward, who helps her find her way in the world. Tilly shows herself to be a strong, independent individual who is not afraid of hardwork. The illustrations in this children's book are the real gem, as they are extremely rich and detailed and make Tilly's world come to life for the reader. 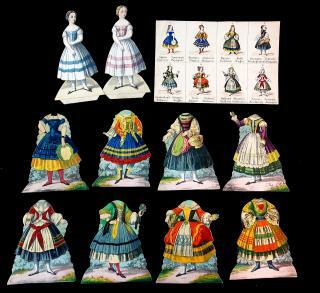 Measures 10 x 8 1/4"
A set including two (2) single-sided 6 3/4" female paper dolls and eight (8) costumes depicting regional variances from various nations in Europe. Each of the costumes is lithograph with an egg wash finish. Also includes a 6" x 8 1/2" sheet depicting all eight costumes, again with egg wash finish and the name of the country printed in English, German, French and Italian. The countries include Spain, Hungary, Russia, Germany, Switzerland, Italy, Holland and France. The original box is lacking. . A 12" Scotsman dressed in a traditional kilt with with shoulder sash and belt. Embellished with feathers on his hat and belt. Finely detailed facial and hand features. Not the detail on his stockings. A simple string mechanism allows him to dance..
A 7 1/4" cut-out two-sided Annette the nurse paper doll and baby Pauline. In original envelope with additional two-sided costume a cloak for baby Pauline. Printed on heavy stock. Note that these are only so-called "French Paper" doll, just an advertising promotion by McLoughlin of a nurse in French regional attire. The set is believed to be complete. See Howard pg. 191.. This listing is one of two different Friendship Press paper dolls we have acquired. They are Friendship Paper Dolls - United States. Friendship Press, 150 Fifth Avenue. New York. Illustrated by M. Pugh. Copyright 1933 by G.Q. Le Sourd. Each paper doll is a vividly colored depiction of an American minority of the day. The doll is in "American" attire with the costume in a more traditional or stereotypical attire. Fine cultural Americana. This listing is Angelina, Our Italian Friend. Depicts an 8" girl in a school dress. His "traditional" attire is gaily colored outfit in red, white and green. Sheet measures 8" x 10 1/2". Condition: surface soiling. Otherwise fine. One of two different Friendship Press paper dolls we are offering. They are Friendship Paper Dolls - United States. Friendship Press, 150 Fifth Avenue. New York. Illustrated by M. Pugh. Copyright 1933 by G.Q. Le Sourd. Each paper doll is a vividly colored depiction of an American minority of the day. The doll is in "American" attire with the costume in a more traditional or stereotypical attire. Fine cultural Americana. This listing is Wenonah, our Indian Friend. Depicts an 8 1/4" Native American girl with braids. His "traditional" attire is a fringed colorful Native American costume complete with "papoose". Sheet measures 8" x 10 1/2". Condition: light surface soiling otherwise A 5 1/4" front and back paper doll stylized after McLoughlin's 1890s Clara and Alice. She holds a card that reads Brook's Spool Cotton is the best. There are spools of thread at her feet. Her three (3) costumes appear to be regional attire from various countries, perhaps Spain, Turkey and the Netherlands. Appear to be cut from a sheet with advertising on reverse. Missing surface litho on the reverse of back side of each costume and doll presumably had been glued down at one point and carelessly removed..
H. E. J. 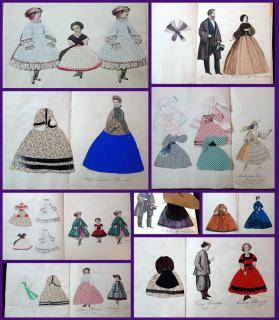 Handmade Jenny Lind Paper Doll w 5 Handmade Costumes. ..
A group of nine (9) different 8 3/4" paper soldiers that have been cut an applied to heavy card stock. Believe them to be French Infantry Soldiers. c1870s. Most like printed by F. Wenzel in Weissenburg. Vibrant color with gouache finish. Condition varies. Three with broken bayonettes. Come neck and ankle bends. Fine group of soldiers. A 6" handmade pen and ink and watercolor Jenny Lind paper doll with 4 cut and one uncut costume. The uncut costume has two guards pencils in the background. Fine replicas copied from the Albert Davis Collection of prints. . Johanna Maria Lind (6 October 1820 – 2 November 1887), better known as Jenny Lind, was a Swedish opera singer, often known as the "Swedish Nightingale". One of the most highly regarded singers of the 19th century, she performed in soprano roles in opera in Sweden and across Europe, and undertook an extraordinarily popular concert tour of America beginning in 1850. She was a member of the Royal Swedish Academy of Music from 1840. Four (4) original watercolor designs are attributed to Jane Langton while a graduate student at Radcliffe. Although not signed they were given to the previous owner by Ms. Langton as her work. Finely detailed well executed art. Created on art board, each measures 12" x 8 1/2". . Jane Gillson Langton (1922-) is an American writer and author of children's literature and mystery novels. She both writes and illustrates her novels. Previous owner indicated they came with a note "I made these tiresomely stylized dolls when a graduate student at Radcliffe, about 1946" 12 pp. Paper wraps. Images of paper dolls on the cover. Includes three (3) paper dolls and four (4) pages of outfits. 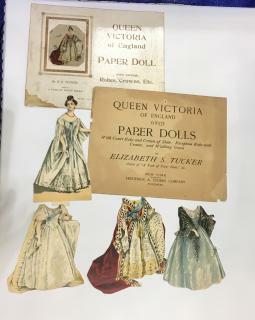 The reverse of the page provides a narrative description, sizing information and pricing for each of the paper doll costumes. The introductory note asks the children not to cut out the dolls until mother has ordered the desired outfits. Additionally with an order from the book a little Bendel gift scissors is given to the child... Measures 9" x 7". Light staple rust. A 14" x 11" uncut paper doll book with scene of soda shop with juke box on the front and back covers. Four (4) punch out dolls (2 each cover). Six (6) costume pages -- with all of the typical 1940s iconography - the jock football costume, the kitchen frock complete with apron, hats with most dresses and of course the prom dress.. A 14 3/4" x 10 1/2" children's page from People's Popular Magazine. It is the Junior Joys for Girls and Boys. This is the Girl's page. It features the story of The Sad Bird-House and a 5 1/2" x 2 3/4" "jolly calendar" for little girls to trace or draw outlining women's work by day of the week i.e. Monday is wash day, Tuesday is ironing day. At the base of the page is Polly Flinders, a 1 3/4" paper doll with 3 outfits and a doll plus a she also has an anthropomorphic or dressed bird with a sinlge outfit. Edge wear and toning. An 11" x 9" embossed die-cut mechanical marionette valentine paper toy apparently by by Raphael Tuck & Sons. Ltd. Depicts a little Irish boy, dressed in his green jacket with four leaf clovers on his hat. Brads hold arms in place and are raised and lowered by a string tie. Reverse is blank. Condition: light edge wear. One hand has been professionally replaced. Scarce item. Mary Jane is a blue eyed blonde that comes with clothing to go skiing, paint, have tea, and go out and about. There is a punch-out suitcase with her name attached.Measures 10 1/2" x 9 1/2": Whitman Publishing Co. Illustrated: Florence Winship1941. 1 Doll, 4 costume pages. May Lee, a brunette with brown eyes, can be an aviator with gear or can dress up in a sailor dress among other outfits. She comes with a punch-out suitcase with her name.Measures 10 1/2" x 9 1/2": Whitman Publishing Co. Illustrated: Florence Winship1941. 1 Doll, 4 costume pages. McLoughlin Bros. 1875. This doll is the same doll later used in the Dolly Varden Series for Betsey Brunette and Bertha Blonde. As stated on page 95 of Those Fascinating Paper Dolls - An Illustrated Handbook for Collectors, Marian B. Howard, an excerpt from the 1875-76 catalog reads "DRESSED PAPER DOLLS". These are a new feature in the Doll Line, and make attractive and salable gifts. In the different series, the figures vary in size and in style and beauty of the toilets. They are made of fine imported papers, in imitation and moire antique and coded silks, elaborately trimmed in imitation lace and are only excellent by the original fabrics. the dresses are full plaited skirts with slight trains. DOLLS WITH TISSUE DRESSES - Series 1 - Three Kinds: Baby - Brunette - Blond. "The figures are eleven inches in height, made of pasteboard and give front and back views. The dresses are made of tissue paper tastefully trimmed with sash.Condition: some wear to costume. Doll in excellent condition. A 5" x 2 3/4" mechanical, die cut valentine card. This is officer #14 looking mean. He has on a full uniform and he is carrying a Billy club. The verse is simple 'I want to COP your Heart.' If you move his head you will see a young boy's smiling face. Above his right arm is a heart with a sentiment ‘My Valentine.’ The condition is good. Reverse has pencil inscription. An embossed, die cut, Mechanical Umbrella with a Girl. This 5 3/4" x 3 3/4" valentine card has a young girl dressed in a blue and white dress with matching blue and white hat. Even her socks and shoes are blue and white. In her hands she has a arrow with a tiny red heart. There are two sentiments, one on the umbrella ' My Valentine' and under her shoes 'Kind Greetings.' The condition is very good. Reverse marked Tuck & Sons. A 10 1/2” x 15 1/2” sheet from the Ladies Home Journal. It is one of several in a series of rocking or movable paper toys or dolls to cut and construct. Each has a military theme to advance the war effort. Illustration by Henry Anson Art. This sheet is The Baby Tank Corps - Terry Tupper commands the tank America, with his friend Billy Blithe, and Ruff, the cat. Condition: edge wear. A 10 1/2” x 15 1/2” sheet from the Ladies Home Journal. It is one of several in a series of rocking or movable paper toys or dolls to cut and construct. Each has a military theem to advance the war effort. Illustration by Henry Anson Art. This sheet is Uncle Sam’s Fighters with Captain Dickie A. Medalwinner and Miss Polly Pitcher, the World’s Smallest Soldier. 1919. Condition: light edge wear. A 10 1/2” x 15 1/2” sheet from the Ladies Home Journal. It is one of several in a series of rocking or movable paper toys or dolls to cut and construct. Each has a military theme to advance the war effort. Illustration by Henry Anson Art. This sheet is Uncle Sam’s Fighters - a new sereis of cut-out toys that move. The first set: Wig-Wag Willie, the waggish sailor, and Knit-Knot Nettie, his sister. Condition: overall excellent. Image depicting the front facing Charles, Duke of Berry. Whole length with curled wig. Engraving and etching on laid paper with hand-applied color, fabric swatches inlaid from behind. Includes fine brocades and silks. Believed to have been adapted for use by a clothier to promote their fabrics. Site view 11 3/4" x 8". Figure height 6 3/4". Housed in modern frame, not removed. A four leaf book including the covers. Wraps Images of Little Bo Peep on the front and Little Red Ridinghood on the back. The inside covers of have the Little Bo Peep rhyme and story of Litte Red Ridinghood. A costume page for each character. Directions included. The head of the Bo-Peep on cover is die-cut for proper placement of the costumes. Each has die-cuts for costume tab placement. Measures 13 3/4" x 7 1/2". .
A 4 page book with paper covers. A Cut Out Doll and Dresses. The 7 1/4" paper doll is on the cover and designed to be cut-out. Each page is a ball gown. Measures 8 1/2" x 7". desgined by Mrs. Tom L. Ketchings penned at base. Accompanied by letter from the Tom L. Ketchings Co. advising the customer that the doll was created by Mrs. Tom L. Ketchings, wife of the boss. Letter dated 1948. Scarce. My Real Dollhouse is an activity book where each page when cut out and properly folded makes one room of the doll house. Along with the directions the following rooms are included the Kitchen, the Garden, the Play-Room Circus, the Living-Room, the Nursery, the Dining Room. The rooms are wonderfully charming colored lithographs depicting scenes in each room. The covers There are no dolls with this book. Measures 13" x 10". Heavy edge wear. The covers themselves are soiled and partially detached and the back cover has a section that is fully detached. The interior pages are fully detached, and the direction sheet is toned and brittle due to age. The rooms themselves have some edge wear and are tone, and cut out. There are crease marks where they were folded in order to make them stand, and in some cases there are slight tears along these folds. An uncut four fold paper doll set and it's original envelope. It is the Furnished Fishery with Several Dolls for Dressing and nice toys for same. It is one of six different designs for the My Smallest Doll's Room. Made in Germany 10305. In the uncut state measures 3 1/4" x 13 1/2". The two fold scene has six "slits" for placement of the dolls, their costumes and accessories. Most likely from the 1930s. This is a scarce item. Condition: excellent. An uncut four fold paper doll set and it's original envelope. It is the Furnished Fishery with Several Dolls for Dressing and nice toys for same. It is one of six different designs for the My Smallest Doll's Room. Made in German. In the uncut state measures 3 1/4" x 13 1/2". The two fold scene has six "slits" for placement of the dolls, their costumes and accessories. Includes a boy and girls transporting fish from the shore. 3 costumes plus accessories and twofold shore scene. Most likely from the 1930s. This is a scarce item. An uncut four-fold paper doll set with its original envelope. It is the Furnished Nursery with Several Dolls for Dressing and nice toys for same. It is one of six different designs for the My Smallest Doll's Room. Made in Germany 10300. When uncut measures 3 ¼” x 13 ½”. The two fold scene has six "slit marks" for placement of the dolls, their costumes and accessories. light toning on envelope An 11" x 13" litho on press board spiral bound book. Edited and Illustrated by Florence and Bob Dalton, There is one die-cut stage page with proscenium on the front and directions for use on the reverse or “the behind the scenes”. There are also eight (8) quarter page nursery rhymes pages with the verse on the left pages and an image of the backs of the heads of the audience on the right. The stage is designed with three slots to insert the base of the stick puppets. It includes 16 stick actors and prop puppets with a die-cut character(s) on top of each stick. They are stored in captioned slots on the inside front cover that also displays instructions. . The verses include Little Miss Muffett, Jack and Jill, Humpty Dumpty, Hickory, Dickory, Dock, Jack Be Nimble, Georgie Porgie, Little Bo-Peep, and Hey, Diddle Diddle. Night scene on back inside cover. . Scuffing and surface wear. Complete. A 10” x 14 ¾” uncut color newspaper cutout depicting a stereotypical Japanese family. It is titled A Japanese Family – A Pretty and Interesting Cut-out by Lawrence Semon. Copyright 1910, by the North American Company. Includes two adult paper dolls standing with a woman seated in front of a screen and a gentleman seated in an outdoor setting. Sheet has been affixed to lightweight cardboard; otherwise fine. A 5 ½” paper doll and six costumes and four hats. It is Dolly Delight from Artistic Series #106. Patd. Feb 20th, 1894. Raphael Tuck & Sons, London. etc. This is a complete set. Dress colors and dress length are four long dresses, orange, yellow, and purple with hat, green with hat. Two short dresses with matching tights, pink with hat and green with a hat. Condition: Minor repair on left wrist. Moderate wear. A 12” easel back paper doll with four costumes and two hats. It is Sweet Alice from Dolls for all Seasons, Artistic Series#503. Patd. Feb 20th, 1894. Raphael Tuck & Sons, London. etc. Dress colors are a yellow dress with matching hat, outside wear red cape with black muff and red boots with matching red hat. A blue dress with white lace and left hand is holding a doll wearing a yellow dress. The final dress is yellow, purple and green. Two hats lacking. Condition: doll is lacking right hand, left ankle and shoe, right ankle crease with tape on reverse, left wrist crease and small crease on face. Cape dress has center crease and hat has small corner crease. Blue dress has right shoe tip with no color. Yellow dress is lacking right shoe tip. Otherwise moderate wear. Reverse marked published to her Majesty the Queen. A 9” easel back paper doll with four costumes and four hats. It is Winsome Winnie from Artistic Series II. Patd. Feb 20th, 1894. Raphael Tuck & Sons, London. etc. The dress colors are purple, yellow, green, and blue. All have matching hats. Condition: doll has tiny crease in left shoe; purple dress has right shoulder crease and umbrella crease. Blue dress and green hat has scrapbook residue on reverse side otherwise moderate wear. Box front cover is lacking two top corners and back of the box. Pictured in 'Those Fascinating Paper Dolls", Marian B. Howard, pg. 193. Note some of the names on the set from the 1875-76 McLoughlin catalog are different. . This how to book was aimed at the fairly new phenomena of paper dolls. 22 pages, followed by multiple plates, some colored, designed to be copied to make dolls and clothing. Brown cloth with title imprinted in gilt on cover. The majority of the book is text written for a young girl, with instructions on constructing their very own paper doll, from suggestion of materials to make the dolls, to ways to adhere various items. Of the original eight plates that were included with the book, three remain, Plate l, Plate II and Plate VI. 5" x 7". .
Patty Lou has red hair and blue eyes and comes with clothes and accessories that include play clothes and toys, a fur coat, and seasonal outfits. There is a punch-out suitcase with her name attached.Measures 10 1/2" x 9 1/2": Whitman Publishing Co. Illustrated: Florence Winship1941. 1 Doll, 4 costume pages. slight wear on cover An 8 pp linen-like paper doll book with four (4) punch-out dolls; two on each cover. A different type of paper doll boo with a page of "trimmings t6hat includes collars, bows, lace trim, belts and much more. The second page are basic dress patterns for each paper doll. The remaining six (6) pages are essentially rectangles of printed paper. It is up to the child to decide which fabric should be used for which costume and how to accessorize it. Measures 13 5/8" x 10 3/4". This book has everything that is needed as an introduction to the shore area of Rhode Island. There are advertisement for various businesses that are located in the relevant area. Two fold-out maps are also included in the book, for ease of navigating when visiting. The majority is dedicated to giving brief descriptions of a variety of places to visit and sight see. Broken up into three sections, Providence, Bay and Shores, and Newport, each has locations recommended. For example, Dexter Asylum, Fort Dumplings, and Redwood Library, to name very few. There are also illustrations of some locations mentioned throughout. 9 3/4" x 6 3/4". First map measures 27" x 24" and second map measure 18" x 22". A 14" x 0 3/4" paper doll book with the two (2) 10" punch-out characters and stands on the front cover. Includes six (6) pages of costumes (including traditional green Robin Hood costumes for both). Also includes accessories. Background motif is Sherwood Forest. The back cover tells the story of Robert of Locksley (Robin Hood) and Maid Marian..
A rather unusual uncut book with an affluent family of six, plus a nurse for the children and Bim the cat and Pal the dog. Each of the punch-out characters has only one leg attached with a second to be attached according to instructions using a needle and thread. This allows the dolls to both "stand alone" and "walk". Total of three (3) character pages and four (4) costume pages. All of the costumes and accessories were designed to give the appearance of wealth and privilege to the degree of each child's costume is holding a different toy. Unique in many ways the characters are quite tall, Father is 15" tall. The book measures 15 3/4" x 10". . Sally Ann, a brown hair, blue eyed doll with an assortments of outfits including a riding outfit, winter furs, and coveralls with dog. Comes with punch-out paper suitcase with nameMeasures 10 1/2" x 9 1/2": Whitman Publishing Co. Illustrated: Florence Winship1941. 1 Doll, 4 costume pages. A set of 24 of 26 Victorian Scrap or Relief alphabet or ABC occupational die-cut figures circa 1880. Each figure measures approx 5 3/4" high and has an associated small scrap with an alphabet letter and verse describing the character. The smaller scraps would have originally been connected with a ladder (or paper strip) to the character. Examples include E was an Earl with pride on his brow, M was a Miser, who hoarded up gold, Z was a Zany, who looked a great fool. Delightful examples of Victorian characters. Condition: lacking the small scrap for "L" presumed Lady, and both characters and small scraps for N & S. Overall light wear. Vibrant color. A scarce group of Victorian ABC or alphabet scrap depicting life at the time. 5 different embossed die-cut Alpine figures dressed in festival attire. All appear to be poised to dance. The women in dirndl skirts and the men in lederhosen all adorned with flowers. They are accompanied by a horse ridden by one of the figures and a donkey. Each measures approx 4 ¼” and is intricately die-cut with finely detailed adornments. Multiple layers used to create the adornments on the animals. Excellent condition. A 7” paper doll with eleven of twelve costumes from a Year of Paper Dolls, by E.S. Tucker. It is for 1895 and published by Frederick A. Stokes Co. <?xml:namespace prefix = st1 ns = "urn:schemas-microsoft-com:office:smarttags" />New York. The set includes the little girl with twelve costumes; one for each month. – One lacking. Also would have contained a sheet of accessories—also lacking. Also includes two (2) hats that were hand made by a creative paper doller. Light wear; some missing surface litho and neck repair on doll. An 11" x 11" book with four (4) "perfectly shaped" statuesque young women paper dolls on the covers adorned in undergarments. The four (4) costume pages contain nip waist dresses and outfits. Most include a matching hat. Also includes a wedding gown. There is one somewhat uncharacteristic outfit with loose fitting pants and sweater with a letter sweater. The border decorations are 1940s feminine niceties such as cosmetics, jewels, gloves, handkerchiefs and handbags-- each with a ribbon background. . The Bridal Party Series “The Maid of Honor” Dressing Doll Sheet No. 107. Uncut Sheet. Published by Raphael Tuck & Sons, Ltd.
A 9 ¾” x 17 ¾” uncut paper doll sheet c1900. It is The Bridal Party Series “The Maid of Honor” Dressing Doll Sheet No. 107. Published by Raphael Tuck & Sons, Ltd. This set may be more familiar in the die-cut boxed verse, but was among a series of paper dolls made by Tuck as a way allowing people of various income levels to afford this popular paper doll. It is difficult to find these paper dolls uncut, as they were eagerly cut and played with by those who waited for the less expensive release of the paper doll. A must have for the Raphael Tuck collector. Repair of separation at center crease. Discoloration right edge. An uncut 9 ½” x 14 ½”newspaper comic sheet with a jointed paper doll to cut and construct. Instructions at right on how to make the paper toy dance. Copyright 1909 by the North American Company. It began on March 24, 1895 with the publication of the 11 3/4" litho on card blonde paper doll with the following message on the reverse: The Boston Sunday Herald will issue, each Sunday, a Fashion Plate Supplement which will be in the very latest style and when cut out will exactly fit on this figure. Order the Boston Sunday Herald at Once". With costumes published weekly. On June 16, 1895 the brunette doll was published. The dolls and costumes were this set have all been cut from the supplements. Not only did the costumes present the latest fashions they provide insight into the changing behaviors of the American woman. The costumes include outfits for tennis, bicycling, traveling, skating, bathing, riding and yachting. All activities that would not have been promoted for women in the 1880s. The costumes include all of those produced for the Boston Herald plus a number of additions printed exclusively for other outlets that picked up the series. Plates lithographed by G. H. Buck Co., New York. Series is known to have also appeared in The Brooklyn Times, Cincinnati Commericial Gazeet, The Chicago Record, The New York Mercury, The Philadelphia Press, The Saint Louis Republic, The San Francisco Chronical and the Washington Star.. A 15 pp book with original slip case. It is The History of Little Fanny, Exemplified in a Series of Figures. Original date 1811. 8th Ed. Includes six (6) of the seven (7) original costumes. Hats lacking. The head has been replaced with a very good watercolor likeness. Wear on slip case. An important part of paper doll history. Although not perfect, a nice introductory piece. The Jointed Paper Doll Family Series by Carolyn Chester was found in The Woman’s Magazine in 1913. Each month a different member of the Jointed family was featured. Each displayed on a magazine page of approx 16” x 10 ½” and designed for a child to cut and assemble the doll and eventually gather the entire family. We have a number of the “family” members listed. Each in the fine Edwardian fashion of the day. Cutting-Out directions at the base of each page. This particular sheet is Jean’s Young-Lady-Sister with her fine high fashion attire. Consists of eleven (11) pieces for cutting and assemblying. Condition: edges trimmed. 1” tape repair at top. The family is all together with the seven members: Father, Mother, Miss Adelaide, Clara, George, Baby, and Bridget the Nurse. Each doll has multiple hand- colored costumes that match with their age and character. Most with three costumes, two with two costumes, Miss Adelaide has two extra hand made dresses. Few hats. Sizes of the doll vary, the father is largest at 6 1/2". .
6 card stock pages with punch-out characters and accessories. No narrative except for brief directions on placement,, etc. All characters self-standing with side easels. Indoor and outdoor scenes with the 3 little pigs, their mother and the Big Bad Wolf. Measures 8 3/4" x 9 3/4". . 14 pp wrappers. Stories and activities involving girls as they should be and behave. Content includs Nancy the little Nurse, a free 'Twinkle' engagement ring premium, Betty Bright-the proper little girl who does everything well, puzzles for the little nurse, Dainty dollies, Sue of the Children's Zoo, Sally Sweet on Sunshine Street, Wendy at Willowtree Farm, Patsy the Panda, The friendly frog, playtime with girls playing jump rope and a Twinkle paper doll anda concluding story titled 'When I Grow Up'. Measures11" x 8 1/2". Some wear. . In French. Measures 7 1/2" x 8". Light toning, otherwise fine. A uncut 7 1/2" x 6 5/8" paper doll sheet promoting Brook's Glace Spool Cotton. It includes a 5 1/2" young adolescent male paper doll with a note in his hand "with Brook's Compliments" and spool thread at his feet. It also includes four (4) miliatry costumes from different branches of the service. The reverse of has advertising to correspond with the reverse of the dolls and the costumes. Instructions for cutting and use also found on reverse..
A 13 1/2” x 16 1/2” uncut sheet on thin stock. Printed and hand colored in vibrant shades. Each consists of 7 pieces and when cut and constructed would measure 16” high. They are a stereotypical Chinese and Turkish man.. Marked Druck u. Verlag v. C Burchardt s Nachf Weissenburg (Els).. A 19 1/2" x 25 1/2" uncut sheet for the litho associated with Les Toilettes Du Bebe. The cover art depicts a scene of 5 children,mother and nanny playing with paper dolls, is labeled "Les Toilettes du Bebe", Also includes two 6 1/2" two-sided paper dolls with ten (10) two-sided numbered costumes, hats and wigs. All with egg wash finish. Several of the costumes feature detail of the child clasping a toy or doll. The cover image is signed B. Collbert (Colibert? ),lithographed by Jannin,and published by the premiere French game maker Saussine. A 10 1/2" x 10 1/2" uncut sheet with a 5 3/4" Sleeping Beauty paper doll seated at a chair with a spinning wheel attached. 4 outfits and a tiara. Reverse is blank.. An 18” x 12” x 1 1/2” box containing “ Puppet Parade - The most Fascinating and Beautiful Toy in Existence” A Reed Toy, Paper Products Division, Electric Coproration of America, Copyright 1943. The set includes A t22” high x 25” wide x 18” deep Puppet Parade Stage with 12 different acts and scenery for each. The 25 characters include The Terrific Trio, Mr. . and Mrs. Bones, Pete and Repete, Midnight Masters, Comrade Borscht, Han ‘n Eggs, Smoothie Smith, Shirley Screech, Professor Discord, Madame Lotta Song, Honeybelle Lee and Henry Highpitch.. Lacking one sheet - Honeybelle Lee and Shirley Screech., otherwise complete including promotional paper wrap on box. Some wear. There is also an instruction sheet for assembly and narratives regarding the characters and a play. The characters as designed in various forms and would be of interest to those who collect mechanical paper. Some have articulated joints, others movable eyes, “3-d” bodies, etc. Quite a charming set. 64 pp. Applied litho on board. Four (4) full color page paper doll or circus animal cutout and characters including Molly May Fall, The Ringmaster, Tik and Tok and many others. Four (4) full color page paper doll or circus animal cutout and characters including Molly May Fall, The Ringmaster, Tik and Tok and many others. All of the illustrations are in tact for this copy. The printed cardboard pages are dispersed throughout the book, each containing two to three characters and accessories. There are instructions for any assembly needed in order to put the character together. There are also easels provided at the back of the book with further instructions, they are also all in tact. Also includes full page black and white illustrations. OCLC - None found (Sept. 2018). While the author wrote and illustrated this story, she is generally more known as an illustrator. She lent her skills to various comic strips and other children's books. A 10 34/" easel back die-cut paper doll with five costumes, one hat and the original envelope. The character first appeared as a comic strip in the New York Herald and its European counterpart the Paris Herald. Fluffy was considered the "New Woman" of the 20th Century. She epitomized the evolution of women into independent thinkers also promoting the current fashions of the day. Costumes include a driving outfit and a golfing outfit. Envelope measures 11" x 8". .